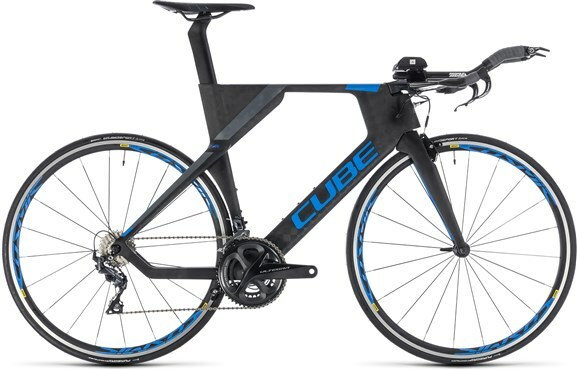 Cube Aerium Race - 2019 Triathlon Bike. Developed to help dedicated athletes push their times down, the Aerium Race is a high-performance machine for podium chasing triathletes and time trialists. One glance will tell you that this is no ordinary bike. The amount of attention which went into every little detail in the frame to maximise performance demonstrates that. The bike is equipped with a Shimano Ultegra drivetrain and Mavic wheels, making it ready for you to go and smash a personal best out straight away. This bike is the perfect symbiosis of ultimate performance, refined ærodynamics and surprising value. You just ran out of excuses... but you also increased your chances of beating the competition. An aerodynamic carbon frame, designed to allow you to smash your current best time. Shimano Ultegra shifting, giving you precise shifting all the way your new best time. Mavic Wheels, light and sure to keep you rolling due to there low rolling weight.